1,0 l - 72% vol. alc. The distillation is in the hands of found out burners, that keep an eye on it, to become just for the myth of the "green fairy." La Valote guarantees the manufacture of absinthe after traditional type. The Destillery La Valote decrees over 3 alambics with a capacity of 25 to 90 liters. Each of the three distillers of La Valote burns after his own personal recipe. So, the absinthe-connoisseur can compare three different kinds of this noble beverage together. The philosophy of La Valote: It remains a small business so that You can offer to the customers good at a favorable price until very good quality. The burner of this absinthe is called "Francis Martin". Among other things, he uses wormwood, balm and Ysoop from the Val-de-Travers. The absinthe is La Valote Martin 72 L'Originale an uncommon La Bleue from the Val de Travers, since these normally have only a percentage of alcohol of 53 percent of vol. alc. - 55 percent of vol. alc. 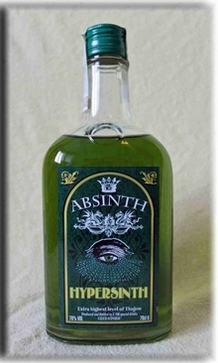 This absinthe even has 72 percent of alcohol, however and we also think that this does this absinthe very much very well. A nectar-same taste with very agreeable scent reveals the absinthe-lover this absinthe with the pleasure.